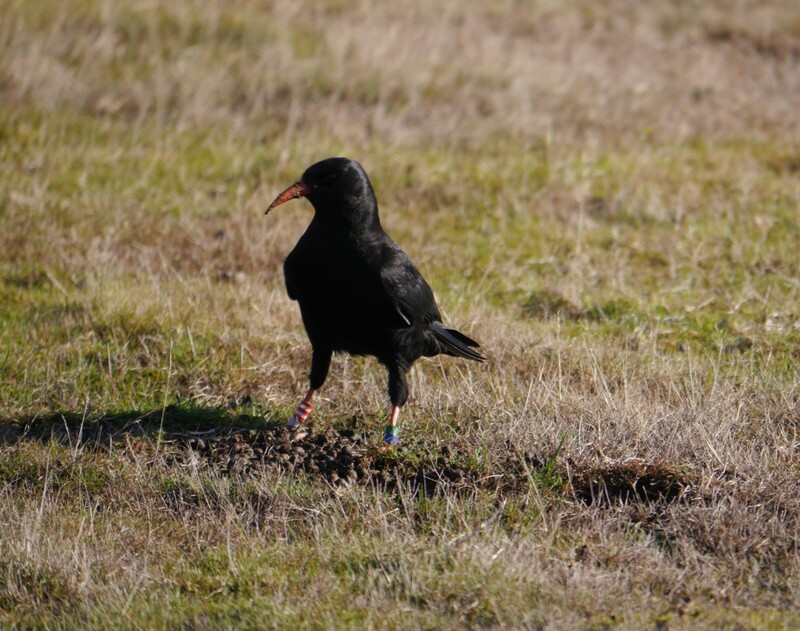 October marked six months since the release hatches were first opened in 2014 and five months of living free for the six older choughs. I am, therefore, delighted to report that they are doing amazingly well. Even more pleasing is their decision to return to the aviary to roost with the juveniles each night. They are behaving exactly the same as any wild chough. Foraging for insects, sheltering on cliff ledges, and fully aware of potential predators. The only difference being that they return for extra food at the aviary when we call them in. 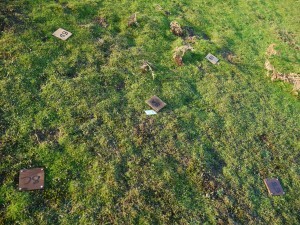 Although if you are a Scottish chough living in Islay this isn’t that unusual. Eric Bignal’s work with supplementary feeding is once again being highlighted in the UK media. 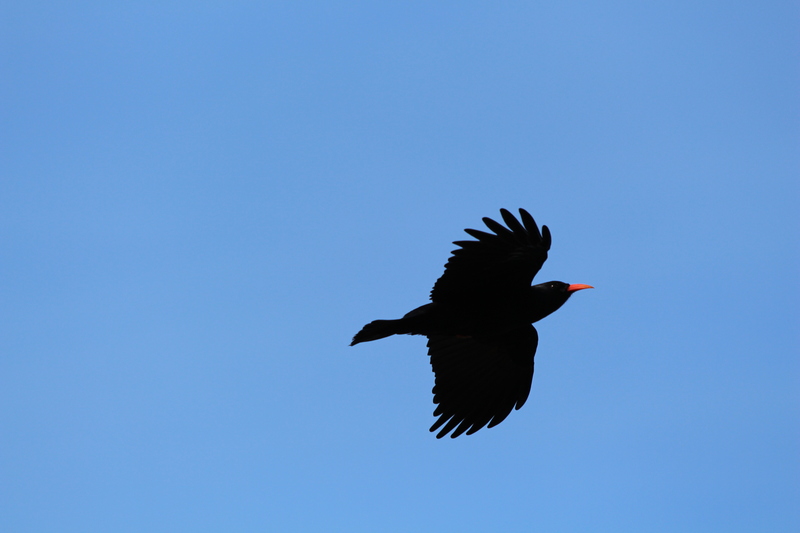 Supplementary feeding study of wild choughs living in Islay showed an increase in juvenile survival rates over-winter. Bignal, E., & Bignal, C. Supplementary feeding of sub-adult choughs. British Wildlife 2011: 315-319. 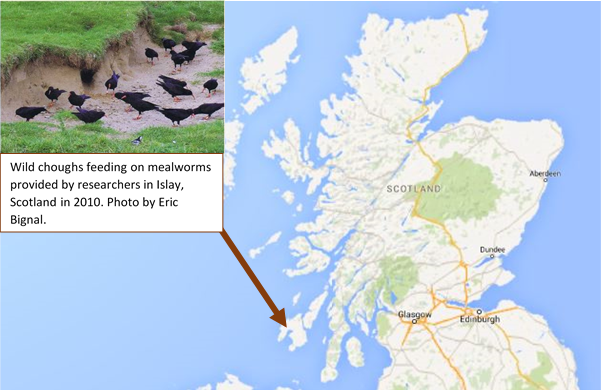 Eric and the Scottish Chough Study Group started a programme of controlled supplementary feeds providing wild choughs with a daily ‘top up’ of mealworms. Survival rates in juvenile choughs during their first winter are very low due to limited availibility of insects at that time of year; insect numbers are lower, ground frosts block access to the soil. After several years of supplementary feeding, the choughs on Islay have increased in breeding pairs from 39 in 2013 to 46 this year (report published in British Wildlife). Still a long way to go to get back up to the 95 they had in 1986, but evidence that this sort of management in the wild can work. Click here to learn more. This work has been critical in how we planned the Jersey project and we fully expect to continue with some form of supplmentary feeding in the future. 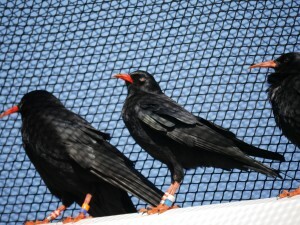 At present the Jersey choughs are receiving two feeds a day from staff. Without knowing exactly how many calories each of our choughs are getting from the wild it is difficult to quantify how much extra to give them. We tried reducing the quantity of insects and drymix per feed by half this month. We gave them a week to adjust, continued to monitor their body weights, and their general behaviour. Constant hounding of staff by the choughs suggested that they weren’t finding enough in the wild. We tried to leave it long enough in order to rule out complaicancy of not getting an easy meal. I’m still not convinced, but don’t have enough will-power to crack the whip just yet. 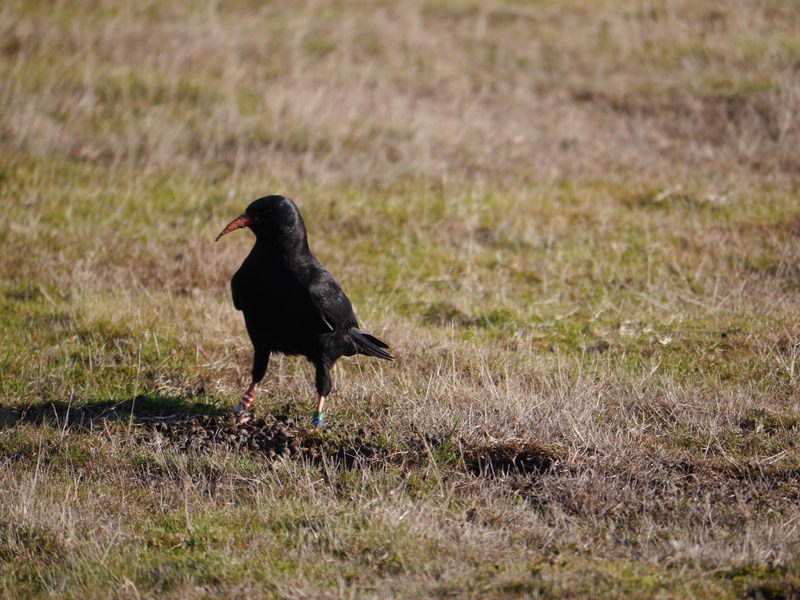 To try and get a handle on what the choughs are eating out in the wild we have set out pitfall traps and randomly selected sites within the choughs’ current foraging area. These will be checked once a day for five days and repeated every month. This will allow us to assess seasonal variations and help us to indentify the insects we found in the faecal samples that we have collected. This month we are starting to see a lot more beetles in the feacals and pellets as opposed to ants and hawthorn seeds back in September. 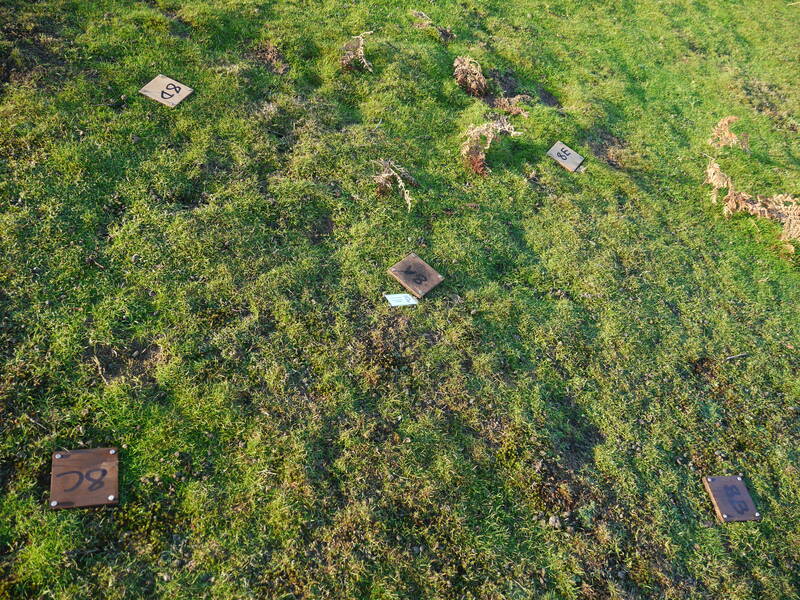 Pitfall traps in the ground at chough feeding sites to study insect abundance. Photo by Liz Corry. Will and our new student, Jennifer, have been creating an identification guide for the invertebrates we are likely to find based on existing studies and what is found in the traps. For image copyright reasons this report will only be for internal use for the time being. However, we would be very keen to see this developed into a much wider available publication for Jersey. 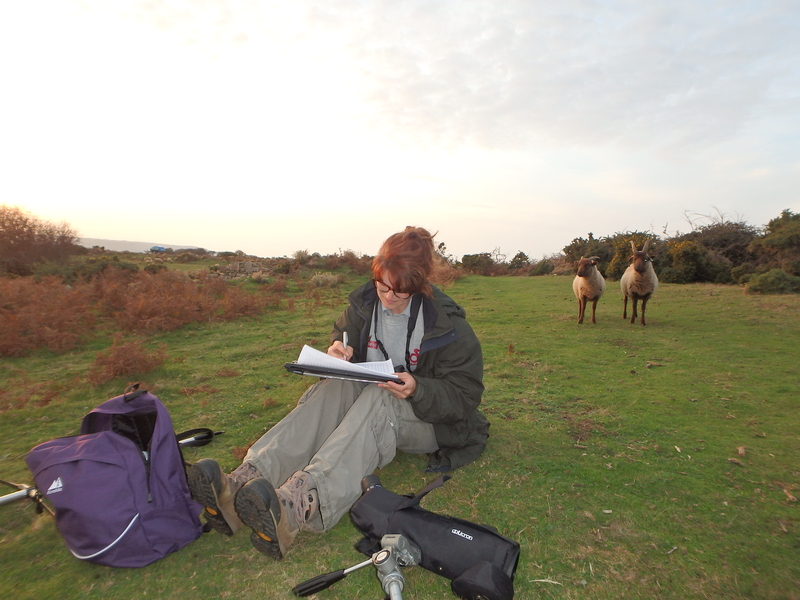 New student Jennifer began her six month placement studying the choughs…not the sheep! Photo by Harriet Clark. Jennifer Garbutt joined the chough team this month for a six month placement on the project. Jennifer has just finished her Master’s Degree at Bristol and hopes to further develop her research skills for a career in conservation. As a new arrival to Jersey the first few weeks of driving green lanes to follow choughs has been quite daunting, but a welcome challenge. Jennifer is our first student who has been able to commit to longer than the minimum three-month requirement. Often by the time you have learnt the ropes it is time to leave. By committing longer term there is undoubtedly a greater benefit for all. We will be inviting people to apply for our student positions in the New Year. The placements are currently full until March 2015. For more information and how to apply please click here or phone 01534 860045. Faecal samples were submitted to Durrell’s lab this month as part of our post-release health monitoring. 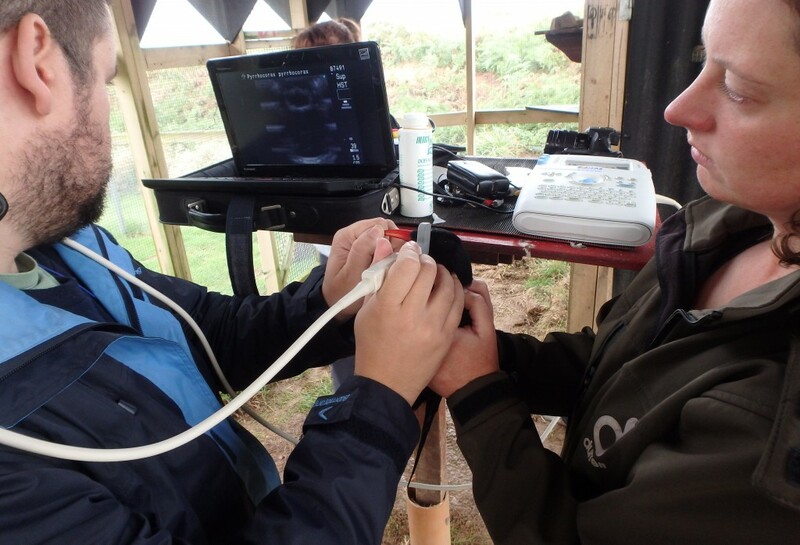 This coincided with the Wildlife Park’s bi-annual screening programme in which every animal at Durrell is sampled. To save Ann’s, our lab technician’s, sanity we treated the post-release samples as their bi-annual check as well so she only had to do half the amount of testing. Thankfully nothing came back on the results to cause Ann even more stress and the birds seem happy. That said, we did have two veterinary cases this month which have left us all somewhat baffled. On the last Saturday of the month at a supplementary feed Egg (red leg ring) seemed a little off colour. When the rest of the group had eaten and flown off to play on the cliff tops she stayed in the aviary. Her body weight was average and she showed no external signs of injury. She was observed closely for the rest of the day but showed no improvement and was not eating. Egg was locked into section 1A of the release aviary and the vet was called up to examine her. Both vet and keepers drew a blank. Egg’s faeces showed no sign of infection and there were no other clues to suggest a reason for her depression. She was kept in the aviary for the next two nights with the other chicks roosting next door, and monitored closely. Egg started to eat and her mood had picked up. On the Monday morning she was released back out of the aviary and joined the others straight away. Egg’s condition will remain a mystery. We just hope this is a one off for her. Our most alarming mystery this month, however, involved Jean (white leg ring). On the morning of the 11th they was no sign of her at Devil’s Hole foraging with the others. We found her perched alone in a roost box in the aviary at 08:20. She flew out in alarm when we approached and joined the others who had also flown over to Sorel by that point. When they were all back in the aviary for lunch Jean’s left eye was closed. When the others had finished eating and flown out she remained perched. We shut the aviary hatches so we could get a closer look without her flying away. It was clear that something was up with her eye and on the vet’s recommendations she was caught up and examined. The surface of the eye was very cloudy suggesting severe inflammation and no menace reflex was observed which indicated that Jean could not see with the left eye. Thankfully there was still perfect vision in the right eye. No signs of ulcers in the surface of the eye were noted and no conjunctivitis was observed. Additionally she was not showing any signs of pain and discomfort at this point. Medications were administered topically and orally given in insects, in order to decrease the inflammation to allow a more detailed examination of the eye. This meant that she had to be confined to the aviary for at least five days. Photos were sent off to a veterinary ophthalmologist for a second opinion. Five days later the eye was examined again in more detail as most of the inflammation was resolved. Jean was still unable to see and an opacity was noted in the lens inside of the eye, suggesting the formation of a cataract. The posterior portion of the eye was still not visible and an ultrasound of the eye was performed to evaluate this area – having a portable ultrasound machine allowed the veterinary team to perform this examination at the Sorel aviary after applying a topical anaesthesia on the eye. No problems were noted in this section of the eye and we decided that the cataract formation was the result of trauma to the eye. Ocular opacity in left eye covering entire lens (left) began clearing up after five days of treatment (right). Photos by Harriet Clark. Jean continued to be confined to the aviary and given anti-inflammatory drugs for the next three days. Weighing up the options with careful consideration for Jean’s welfare we decided it would be in her best interest to release her again. We would continue to monitor her closely and if we felt there was a concern over her mobility due to the loss of binocular vision we would consider confining her to an aviary permanently. Follow up examinations have showed a decrease in the size of the cataract so there is the possibility that Jean will regain some vision in the future but it is very early to say. Having seen her response to a peregrine the day she was initially confined to the aviary we had faith that she would stand a good chance of survival if the choughs continued to act as a group. Choughs are a social animal and remain in continuous contact with each other whether by calling or by displaying a flick of a wing feather. They show each other where to feed and when to stop feeding if a potential threat is approaching be it peregrine or person. She had already gained enough experience to know the lay of the land around the release site and would still roost in the relative saftey of the aviary. If she had a been a bird of prey who is reliant on pin-point 20:20 vision to hunt or a solitary species left to fend for herself our decision would have been different. We are pleased to say that Jean was released back out to Sorel on the 20th, joined the flock straight away, and has been with them ever since. She has shown no concern when flying or feeding. At first, and with strong winds, she found it difficult to judge distance going through the hatches to get to food inside the aviary. Very quickly she learned to adapt and flew in sideways using her good eye for judgement. I hasten to add that we provide food dishes outside as well as in the aviary, she was just greedy and wanted to go to all the dishes. It is clear that she is an intelligent bird and has the ability to learn to adapt qucikly. Only time will tell if the damage is permanent and we may never know what caused it in the first place. This was a huge learning experience for us, the vets, and avian husbandary in general. Let us hope that November has fewer surprises in store! 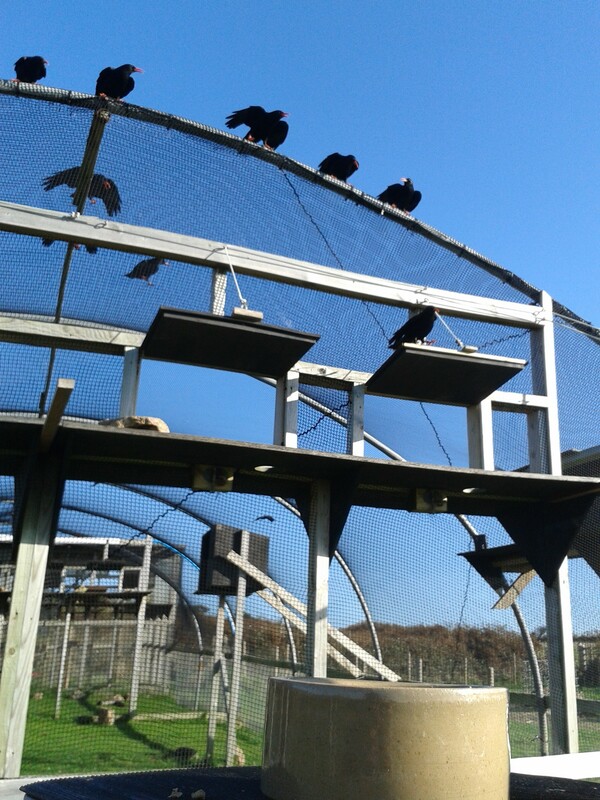 We have had to add more food shelters to the aviary to protect the choughs from the driving rain which hits in all directions. The roof alone does not provide sufficient protection and, with twice as many birds as last winter, we need extra spaces. Will and Harriet fitted the plywood shelters and watched contently as the choughs put them to good use. Juvenile choughs on a windy day in Jersey. 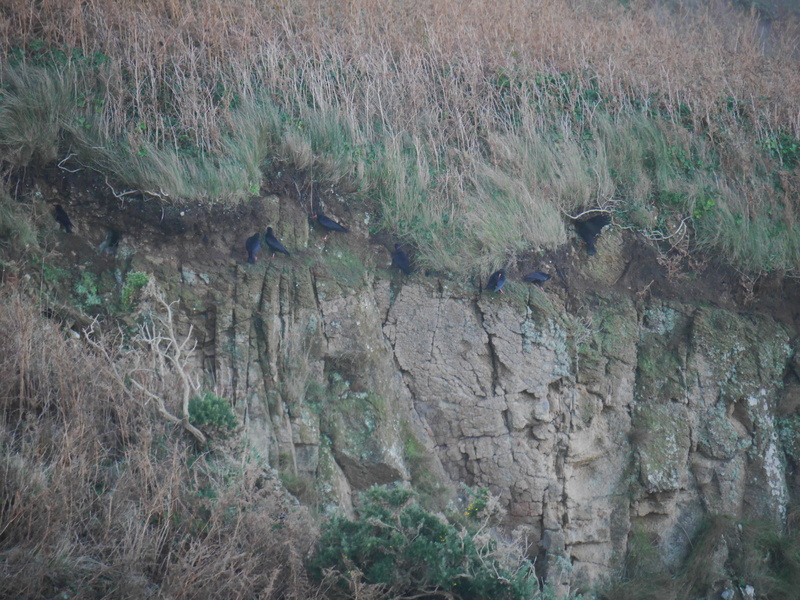 The choughs now seem very settled at Sorel. They have been bathing in the stream at the mouth of Mourier Valley, sheltering on the cliff when it rains, and probing in the Conservation Fields. All of which are new sites for both the juveniles and adults. The biggest change came at the end of the month. At 07:30 on the 27th the team went to Sorel and counted 16 choughs. 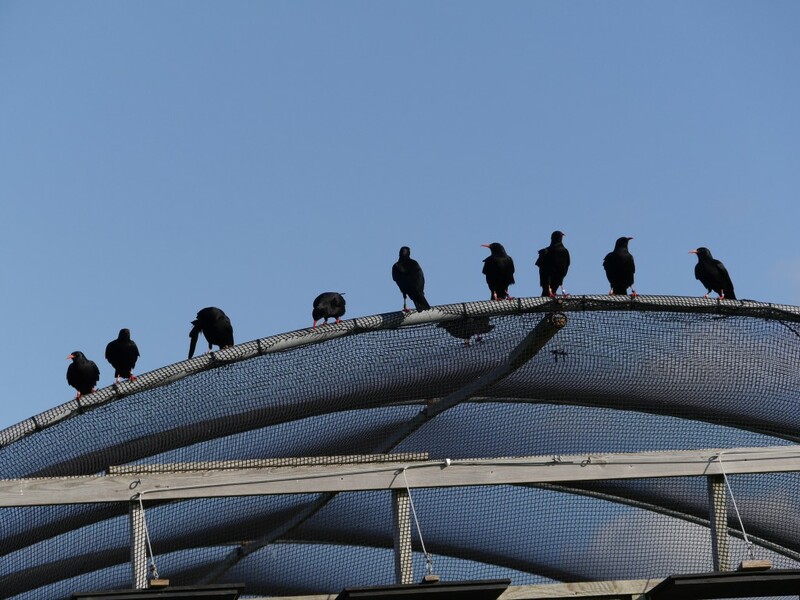 They continued to observe the choughs playing, feeding, preening, until 08:45 when nine juveniles took to the air and flew out of sight over Devil’s Hole (nb: Egg was still confined to the aviary at this stage due to her malaise). In the last few weeks when they have flown beyond Devil’s Hole we have been able to watch them fly over Crabbé, maybe dip out of sight behind the gun range, then reappear. This time they never reappeared! The radio trackers set off the best they could trying to follow signals. However, it appears that motorised vehicles and Jersey’s 15mph, winding, green lanes are no match for a chough. Thanks to reports from members of the public, the team were informed that the choughs had reached the south-west of the Island within fifteen minutes of ‘dropping off the radar’. 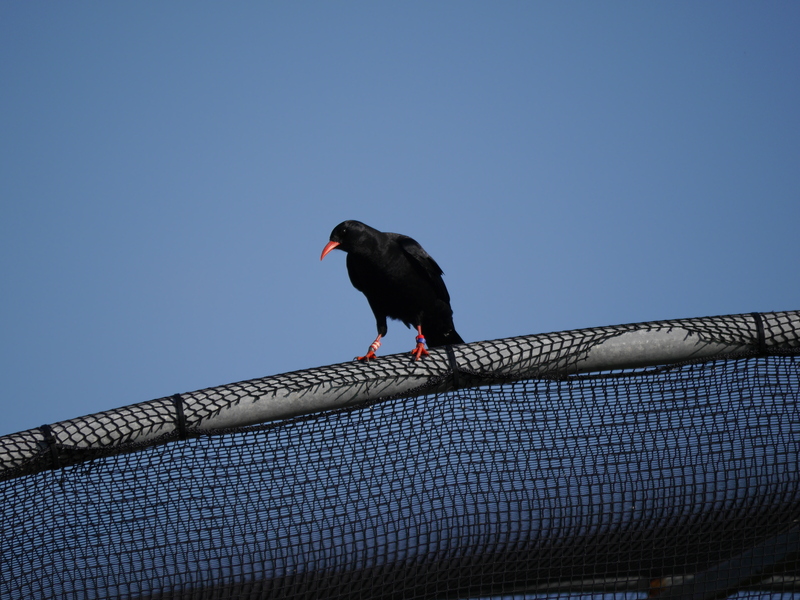 Sticking rigidly to Jersey’s speed limits Harriet made her way down only to find the choughs had gone….back to the aviary. By 10:50 the nine juveniles were visible flying in west along the coast from Devil’s Hole towards the aviary. They joined back with the adults, who had stayed around the release site, and all came down for their lunchtime feed a few minutes later. Egg was released back into the group at this point. The group spent the afternoon around the aviary, although four adults left for the quarry at 16:30. All the juveniles roosted in the aviary. 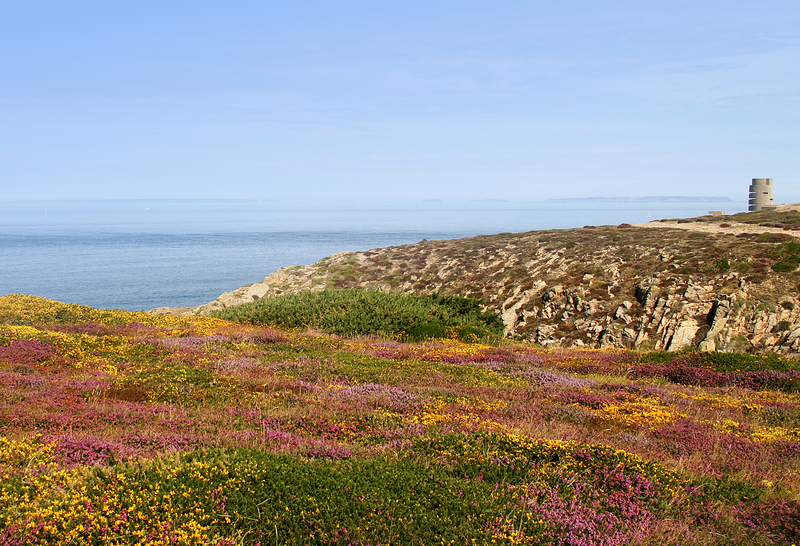 The next morning there was not a single chough in sight at Sorel. Phone calls and text messages came in from the public once again, placing the adults around St Ouen’s Bay (perhaps checking out the best spot for breakfast) and the chicks even further south. This time the chicks were not just flying but foraging on the ground around Beauport and Ficquet Bay. 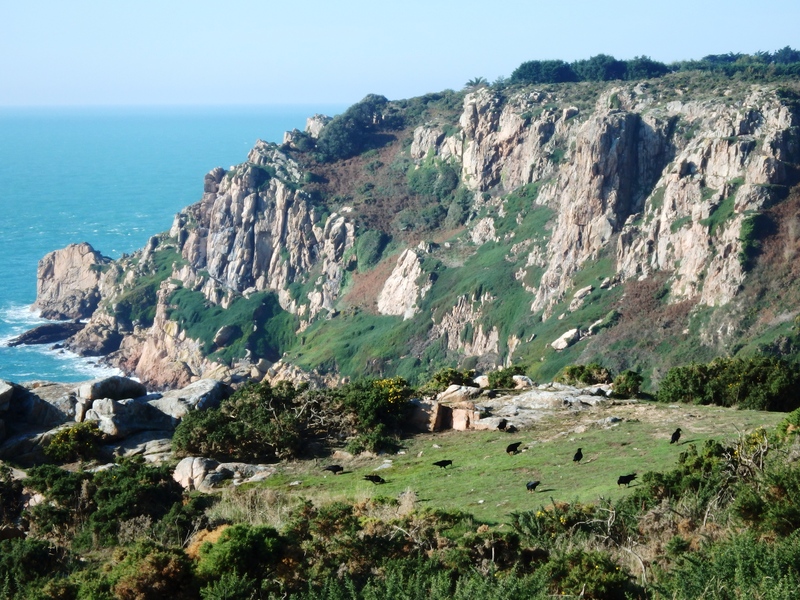 This is a really interesting development as this part of the coast was the last known breeding location for Jersey’s choughs over 100 years ago. Choughs return for supplementary food twice a day. Photo by Liz Corry. The chicks didn’t stay long, returning to the aviary by 11:00. The adults had returned ninety minutes earlier. 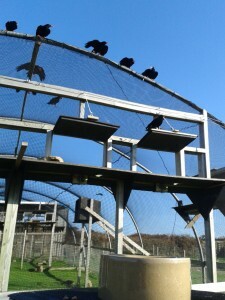 They spent the rest of the afternoon around Sorel and roosted in the aviary again. We think that five of the adults might have spent the night in the quarry. One was spotted flying back from the quarry to the aviary at 16:45, but after sunset it was hard to tell if others had followed suit. We will have to wait to see if this is going to become a permanent pattern of dispersal with the chicks or whether they were just tricking us. Well it was Halloween after all. Speaking of which, an interesting article about Channel Island folklore was sent to the chough team recently. It turns out that we might be dabbling in the dark arts! In the Nineteenth Century when choughs were found across the Channel Islands people were very superstitious about the red-legged bird. Why? Witches wore red stockings as a means of identification and, therefore, in the days when logical thought was questionable, choughs were also, by association, witches. 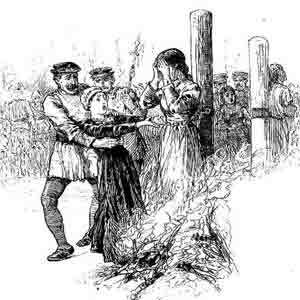 The infamous Guernsey witch Marie Pipet, was even said to be able to turn herself into a chough. Scientific proof if ever one needed it! Thank you to Sarah Nugent for sending this our way and to Guernsey Birds for reference material regarding the choughs. 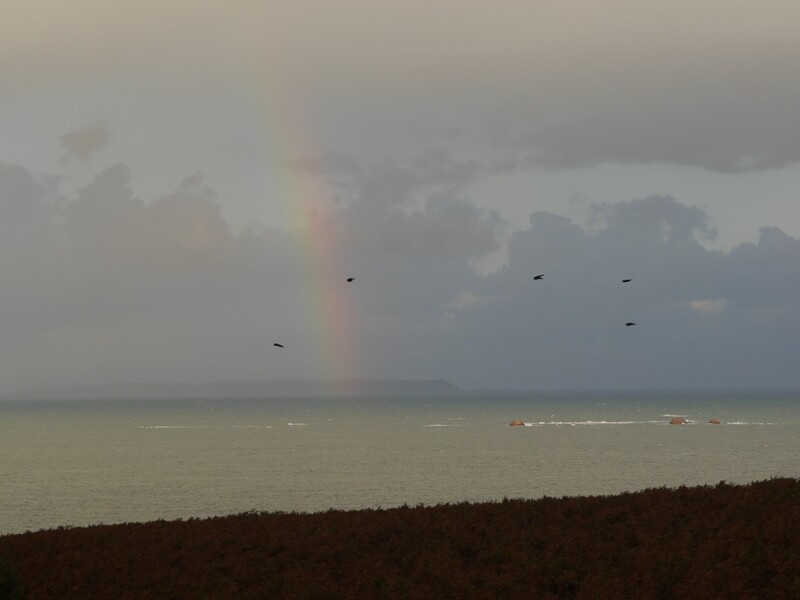 On a lighter note…choughs and a rainbow! This is great news which, put so succinctly by Liz, draws a most encouraging picture of the project so far. Despite the unchartered winter weather ahead, I’m sure everyone has everything crossable crossed for the continuing success of the choughs and for Liz and the team – it’s a great project and a great website – a huge thank you to BOTE. A most heart-warming and positive report. Well done to all concerned. Is Jennifer going to take soil core samples at feeding sites too? 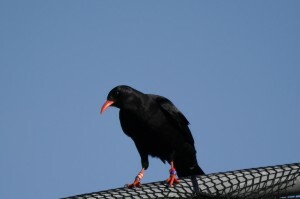 As I’m sure you know only too well, pitfall trapping is not the best replicate of Chough feeding techniques since they trap active surface-moving – often nocturnal – taxa and not subterranean larvae and worms etc. Section 5.2.1 of my thesis addresses this question. Best wishes for your great work. Many thanks Richard. We have taken core samples in the area being surveyed. Work at the moment is to try to develop identification keys of invertebrates in the vicinity of the release aviary to help in analyses of the choughs faecal samples. We hope to be able to get an idea of what natural food the birds are finding.